Amicor has also been very successful in providing a healthier option when incorporated into orthopedic support articles. 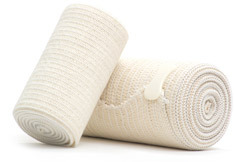 Amicor fibre has been successfully used for many years in bandages that go underneath a plaster cast. The use of a plaster cast can often result in mal-odours forming and also with the skin becoming red and itchy. Both of these common factors are due to bacteria developing on the skin under the plaster cast. By using under-cast bandages containing Amicor it is possible to greatly reduce the growth of these bacteria over the entire duration that a person wears the cast thereby resulting in a significant reduction in irritation and odour.